After 16 years of MMA history, Cage Warriors staged their biggest card of all time in Cardiff tonight to mark their 100th event. It’s a night that’ll be remembered for years to come, with two new champions crowned and every pro fight ending within the distance. In the main event, home country hero Jack Shore remained unbeaten and raised the bantamweight title for Wales. In a near flawless performance, Shore shut down Mike Ekundayo’s takedown attempts and dominated the fight both on the feet and on the mat, securing a devastating TKO in the third round. It was total control for Shore in his most impressive performance to date, on a night that’ll go down in Welsh fighting history. It was a perfect time to announce Cage Warriors’ return to Cardiff for CW104, which will take place on April 27th back at the Viola arena with Wales’ newly crowned champion on the bill. In the co-main, the coveted Cage Warriors featherweight title that launched the careers of fighters such as Conor McGregor found a new home. Dean Trueman lifted the belt after a hard-fought battle with Aiden Lee that had the crowd on it’s feet. Lee threatened early on with numerous submission attempts, but the relentless grit and determination we’ve come to expect from Trueman won through and he struck his way to a third-round TKO. Welshman Aaron Khalid brought home another win for the home crowd with a submission over Håkon Foss, and Nicolas Dalby weathered an early grappling onslaught by Phil Mulpeter to finish the Irishman with strikes. After the fight, Dalby had one thing on his mind – the welterweight belt currently held by Ross Houston, who was in attendance at the Viola Arena alongside current and former CW champs Brett Johns, Nathaniel Wood, Jack Marshman and Paddy Pimblett. Scotland’s Scott Malone opened up the Main Card with a seamless first-round submission over home favourite Josh Reed, climbing ever further toward the coveted bantamweight title now held by Jack Shore. Every fight on the pro prelims also ended within the distance, with 4 out of the 5 in the very first round, making CW100’s undercard one of the most explosive in their 16-year history. Alex Lohoré picked up yet another knockout win over a high ranked opponent in Tim Barnett, and Rhys McKee made his CW debut in style with a stunning TKO over Jefferson George. Aiden Stephen and Brett Hassett both impressed with high-level submission finishes. Before the mammoth pro card, the night began with the Cage Warriors Academy Grand Prix finals, when 7 amateur winners were crowned the top in their divisions. Highlights included first-round finishes for Ismar Blagoje, Oban Elliot and Nathan Fletcher. Next up for Cage Warriors is their much-anticipated return to Liverpool for CW101 on February 16th. Colchester’s own James Webb registered the biggest win of his career in the main event of Cage Warriors 99 at the city’s Charter Hall venue on Saturday, November 17. Webb came into the bout on a run of three consecutive rear-naked choke submission victories, but he showcased striking power against a noted knockout artist as he stunned Jason Radcliffe with a left hook that upset the Londoner’s equilibrium and forced him to the canvas. Webb moved in to finish the fight and referee Rich Mitchell called a halt to the action at the 1:26 mark as Webb positioned himself for a possible run at the middleweight title in 2019. In the night’s co-main event, “Capcom” Cory Tait made a winning return to Cage Warriors with a crushing body-shot TKO of Gavin Kelly in their bantamweight contest. Tait’s last appearance in Cage Warriors came back in 2014 and the man known for his spectacular strikes went back to basics for his attention-grabbing finish, as he landed a perfectly-placed body shot to secure a first-round TKO finish. Danish featherweight Mads Burnell was cracked hard by a powerful uppercut from Lukasz Rajewski early in their bout, but the submission ace showed great powers of recovery before taking over and finishing his opponent via rear-naked choke submission. “Mr. Bag and Tag” Nathan Jones battled all the way to the scorecards with Cage Warriors veteran Brad Wheeler in their welterweight contest as he ran out a unanimous decision victory. And in the opening bout of the night “Young Gun” Jamie Richardson survived a heel-hook attempt from Phil Wells before turning the tables and finishing his opponent with elbows for an impressive first-round TKO win. Cage Warriors 99 goes down at the Colchester Charter Hall this Saturday night, headlined by a flyweight title fight between reigning Champion Nathan Greyson and Blaine O’Driscoll. 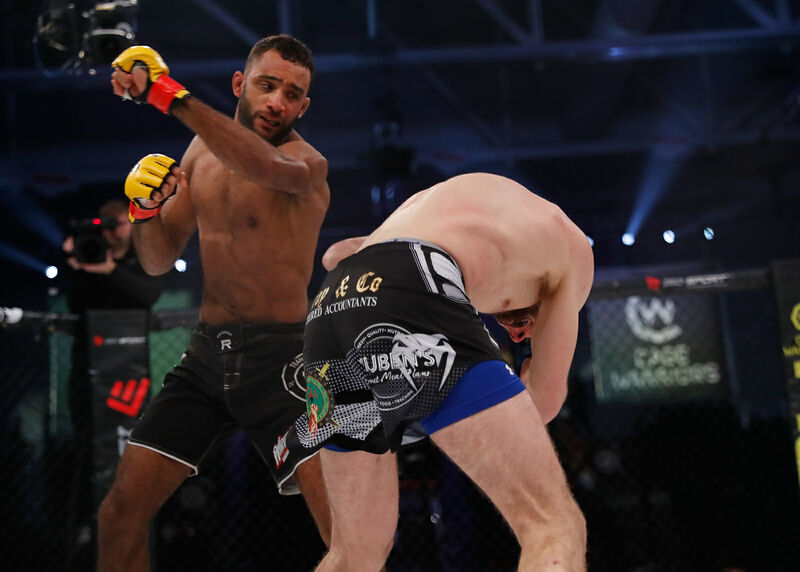 Nathan Greyson’s spectacular knockout win to win the belt at CW92 sent shockwaves through the European flyweight ranks and positioned him as one of the most dangerous men in Europe at 125lbs. Greyson has knocked out his last three opponents and is confident he can do the same to this Saturday’s challenger. Meeting Greyson under the Cage Warriors lights is Irish prospect Blaine O’Driscoll, who returns to the cage after a first-round submission victory over Aaron Robinson in May. O’Driscoll is trained by head coach John Kavanagh at SBG Ireland (home of former two-weight Cage Warriors champion Conor McGregor), making his Cage Warriors debut with a record of 6-2 and finishes in his last three wins. Other big names stepping up to fight this weekend include Mads Burnell, who makes his CW debut after a 3-fight run with the UFC. He faces Polish lightweight Lukasz Rajewski on the CW99 main card. Appearances from South-East England names Steve Aimable, Craig Edwards and James Webb will ensure that the home fans have plenty to shout about at the Charter Hall. Tickets for CW99 are very limited but still available. When Cage Warriors announced plans to hold their 100th event before the end of the year, they promised to make it their biggest show to date. With just two months to go, they have announced that a number of their star names, including Paddy Pimblett, Jack Shore and Nicolas Dalby, will be fighting on the card and look set to make good on that promise. Saturday 8th September – Devenish Complex, Belfast, N. Ireland. The main event sees a bantamweight title fight between ZKJ’s Ciaran Breslin and Fight Academy Ireland’s Glenn McVeigh for the Cage Warriors Academy Ireland bantamweight Title. CW96, Cage Warriors’ biggest Liverpool card of 2018, hits the Echo Arena on Saturday 1st September with two world titles at the top of a stacked card. In the main event, local hero and former Cage Warriors featherweight champion Paddy Pimblett will bid to become the organisation’s lightweight world champion when he takes on in-form Norwegian ‘The True Viking’ Søren Bak for the vacant 155lb title. The four-fight main card also features the latest bout in the career of rising English lightweight Jack Grant, who will look to extend his winning streak to six with a victory over Aleksi Mäntykivi. And the main card will kick off with the return of former Cage Warriors welterweight champion Nicolas “Locomotivo” Dalby, who will take on undefeated Italian prospect Roberto ‘Minotauro’ Allegretti.